IVINS — A truck that burst into flames in the driveway of an Ivins residence spread into the home’s garage Friday afternoon. 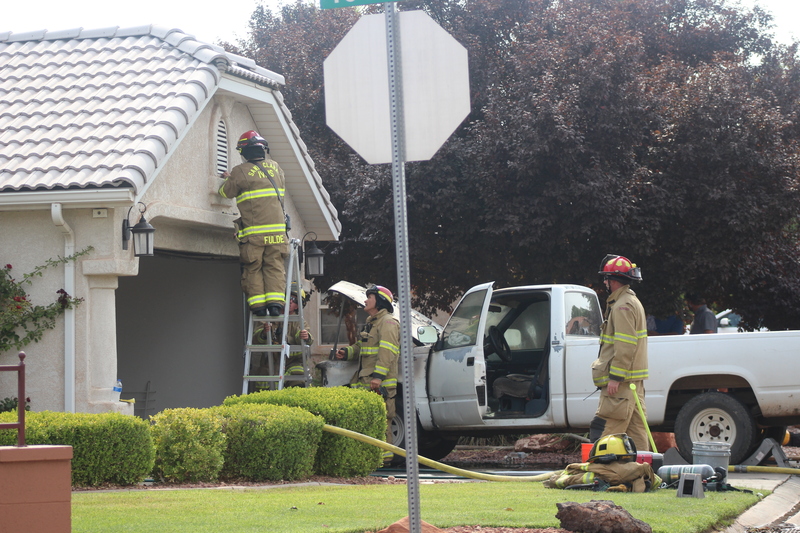 Santa Clara-Ivins Fire Department responded to the blaze involving a white Chevrolet pickup truck at 4:24 p.m. on the 600 South block of 400 East. 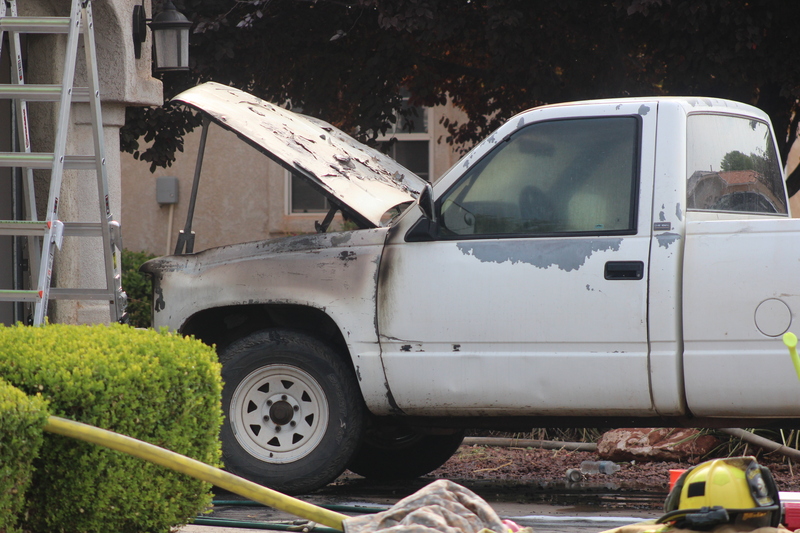 Witness Christina Teed told St. George News she was driving through the neighborhood at the time of the fire. She said she turned the corner and saw the truck “absolutely in flames” with smoke billowing out of it. 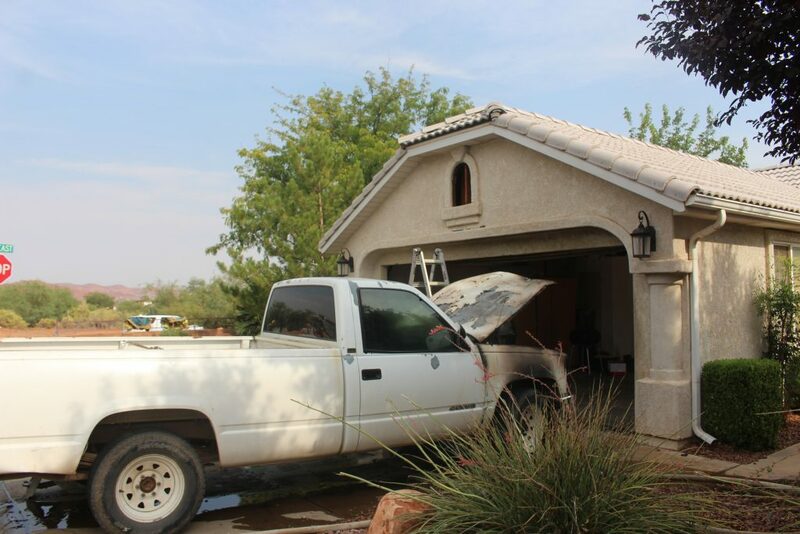 “When it caught on fire, the truck rolled forward into the garage door,” she said. Teed immediately called 911, and the homeowner came out from the house shortly after. They sprang into action as firefighters were en route. 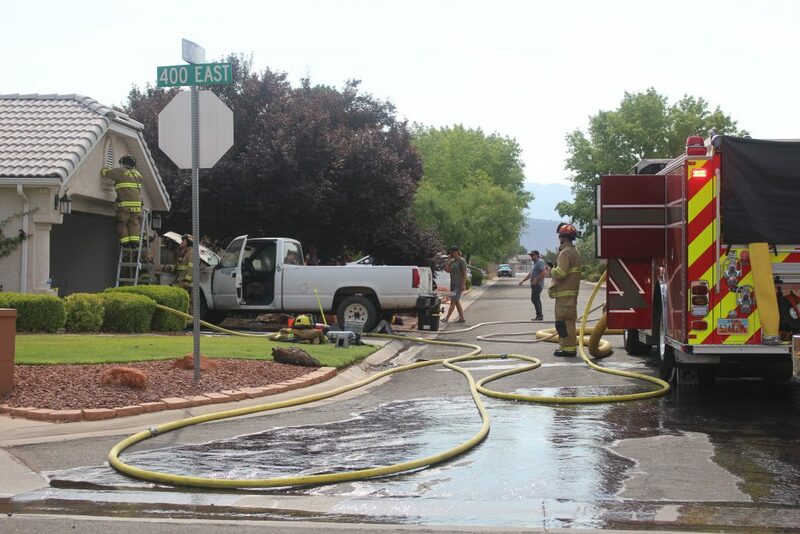 “I got a hose from the neighbor’s house and we both started dousing it from both sides,” she said. Firefighters arrived within five minutes of Teed’s call and went to work knocking down the fire, which by then had spread to the garage door and a small portion of the garage’s interior. Santa Clara-Ivins Fire Assistant Chief Charles Peterson said responding crews put the flames out shortly after their arrival. Around a dozen personnel responded using two engines. No one was hurt, and no residents were displaced as a result of the fire. “The garage door is burnt, as well as a little minor damage to the house,” Peterson said, estimating the cost of the damage to the home to be around $1,000-$2,000. The truck, however, did not fare so well. The fire destroyed the engine compartment, rendering the truck inoperable. Peterson said the cause of the fire is still under investigation. “I talked to the owner, and he had said he was having some mechanical problems with the transmission,” Peterson said, noting that the car was only parked about five minutes before it burst into flames.